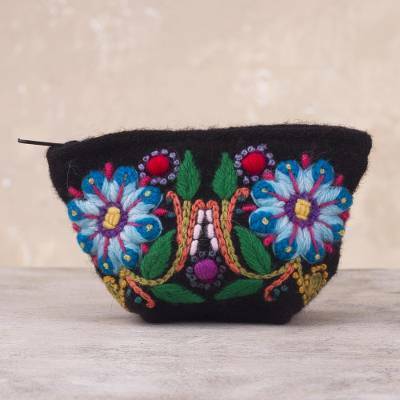 Floral Embroidered Alpaca Blend Coin Purse from Peru, "Peruvian Shopper"
For a striking companion on a day of shopping, this Peruvian coin purse is designed by Balvina Huaytalla. With a body of black, the alpaca blend bag features fascinating floral embroidery that is performed by hand. It opens with a zipper, revealing a cotton blend lining. You can find alpaca blend coin purse 'Peruvian Shopper' by Balvina Huaytalla in handbags categories such as Floral Handbags, Wool Handbags, Acrylic Handbags, Acrylic Blend Handbags, Alpaca Handbags, Alpaca Wool Handbags, Alpaca Wool Blend Handbags, Wool Blend Handbags and Coin Purses Handbags. Enjoy exploring these sections for other Novica treasures.